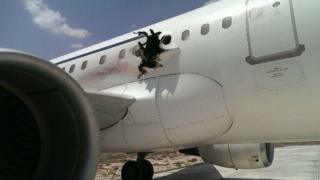 Somali plane bomb: What happened? One suggestion is that the suspected bomber is the same man who was missing and later confirmed dead. 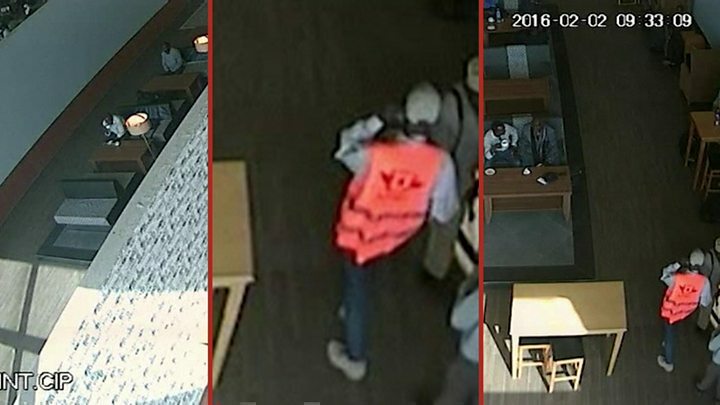 Somali officials say the missing man was called Abdulahi Abdisalam Borle, had a Somali passport and was about 55 years old. He, along with most of the passengers, was meant to get on a Turkish Airlines flight but it was cancelled and Daallo Airlines took the passengers instead. Investigators told AFP news agency that he was "probably" propelled out of the hole in the side of the plane caused by the explosion. On the same day, a man was found dead on the ground in Balad, an agricultural town 30km (18 miles) north of Mogadishu. But the body has not been positively identified. How did a bomb get onto the plane? Somali authorities have released a video they say shows a laptop being given to the passenger after he has passed through the security checkpoint. A man in an orange hi-vis vest is shown walking with a man in a blue shirt holding what looks like a laptop. Another man in a hat approaches them and it is alleged that the laptop is handed over. The implication is that an explosive device was concealed in the laptop. They have since arrested 20 people, including airport staff. Aviation expert David Learmont, however, is sceptical that the video is all that conclusive. "I don't think that anybody knows for sure if this is the transaction that was behind the bombing," he told the BBC's Focus on Africa radio programme. But he added that airport staff are the weak point in security all over the world. "One of the easiest ways into today's system is to subvert employees who have passes to go into airside," he added. The pilot of the plane was slightly more blunt in an interview with Associated Press. "The security is zero," Vlatko Vodopivec said. Why didn't the bomb make more of an impact? The plane's pilot told AP that if the explosion happened when the aircraft was at a higher altitude it could have caused the jet to crash. Bomb disposal specialist David Denman explains that a relatively small explosion - from the amount you can fit in a laptop case or even smaller - can have a "catastrophic" effect. 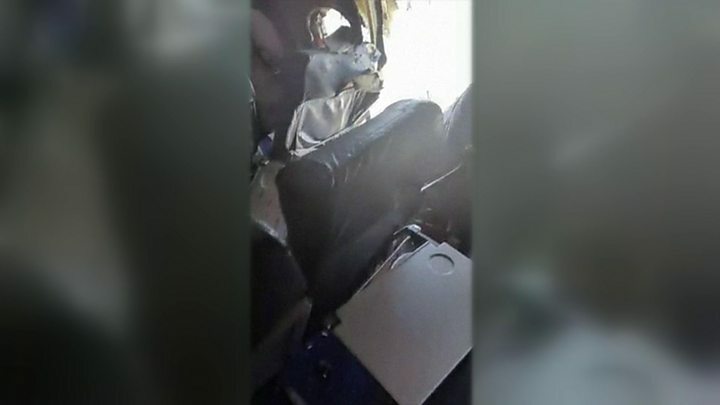 That's because a small explosion, causing a small hole would create a secondary effect if the cabin is pressurised and the plane is flying at a high altitude. Mr Denman explains that in that scenario, the difference in pressure would cause the contents of the plane to be sucked out, making a bigger hole, causing the pilot to lose control and possibly leading to the plane breaking into pieces. Instead the bomb went off roughly 15 minutes after the plane took off, at 11,000ft (3,350m). This resulted in a hole in the side of the plane of about one metre, with the pilot still managing to land the plane safely. So this really leads to the question - why did the bomb explode when it did? That is impossible to know without speaking to those involved in the plot. Why did it take so long for al-Shabab to claim responsibility? The BBC Somali service's Abdirahman Koronto suggests that the delay may because the attack did not have a bigger impact. He points out that al-Shabab usually says it has carried out an attack a few hours after it has happened. In its emailed statement, the group admitted it had failed in is aim of bringing down the plane. The group used a laptop bomb three years ago. But in the 2013 attack it was used in conjunction with a car bomb and six people died. On the other hand, he points out there are also attacks that no-one has admitted to. In December 2013 three Syrian doctors and their Somali colleague were shot dead in an ambush, something al-Shabab denied being involved in.